Having dazzled with his breathtaking debut District 9, director Neill Blomkamp returns in equally emphatic fashion with Elysium. Bigger and more spectacular, courtesy of the extra budget afforded to him in the wake of the success of his debut, the film still manages to retain an intelligence that is increasingly lacking from mainstream cinema as well as some superb action set pieces. Set in 2154, a polluted and decaying Earth has been left to the poor by the rich, who now live in a space station (the Elysium of the title) hovering above the planet. 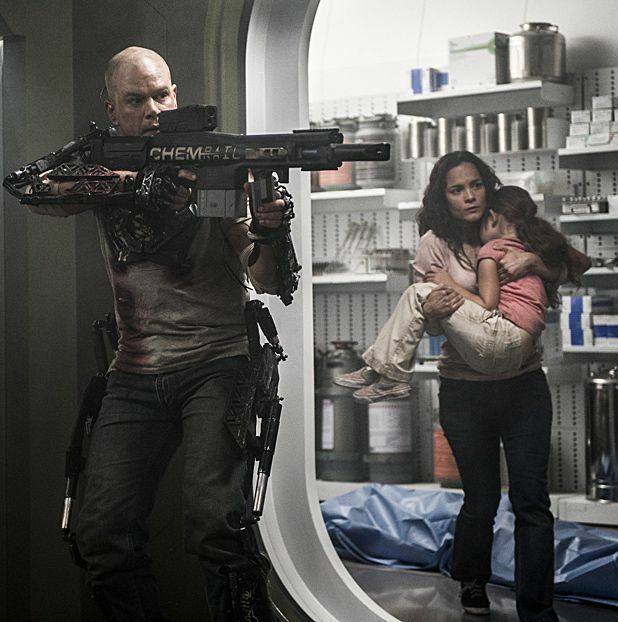 The film follows ex-con Max (Matt Damon) as he attempts to get to Elysium in order to save his own life, which has recently been compromised. Pitted against him are various businessmen and women (William Fichtner, Jodie Foster) and a psychopathic sleeper agent (Sharlto Copley), all of whom have their own agenda. Blomkamp’s film adopts the same gritty, no-nonsense feel that he employed to such notable effect in District 9, while also revisiting some of that movie’s themes – most notably attitudes towards immigrants and the divide between the world’s richest and poorest. After introducing the film’s many characters, he also employs a genuinely exciting race against time scenario, with Damon’s muscular Max becoming an unlikely saviour not just to himself but the rest of the planet. If there are some problems, they mostly stem from the sheer weight of the film’s ambitions, which occasionally undermine its emotional impact as Blomkamp attempts to pay lip service to them all, while nods to other sci-fi classics are clever but unnecessary and threaten to make the film feel more generic. But for the most part, Elysium is a thrilling blockbuster that marries intelligence with spectacle to striking effect and confirms Blomkamp as the new king of the genre in the process. Out on general release now. Blomkamp's eagerly awaited follow-up to the critically acclaimed District 9 features Damon and Foster on another planet in the distant future.